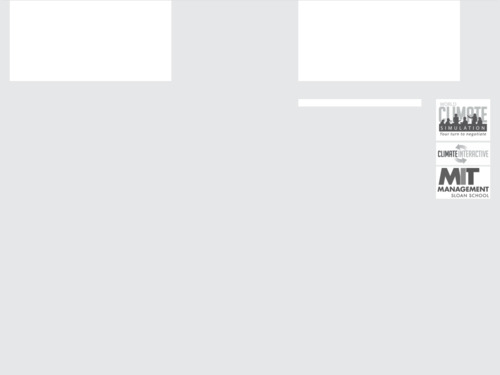 This animated visualization represents a time history of atmospheric carbon dioxide in parts per million (ppm) from 1979 to 2016, and then back in time to 800,000 years before the present. 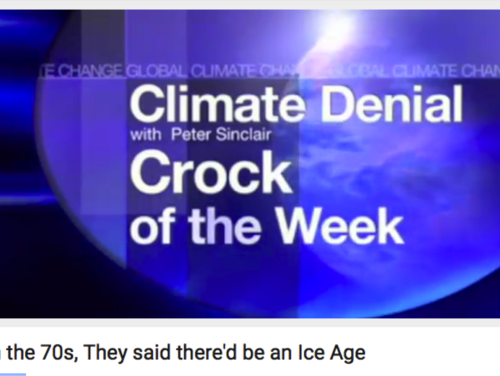 This is a video overview of the history of climate science, with the goal of debunking the idea that in the 1970s, climate scientists were predicting global cooling. These graphs show carbon dioxide measurements at the Mauna Loa Observatory, Hawaii. 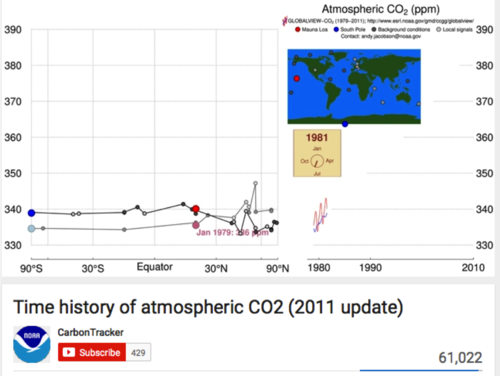 The graphs display recent measurements as well as historical long term measurements. 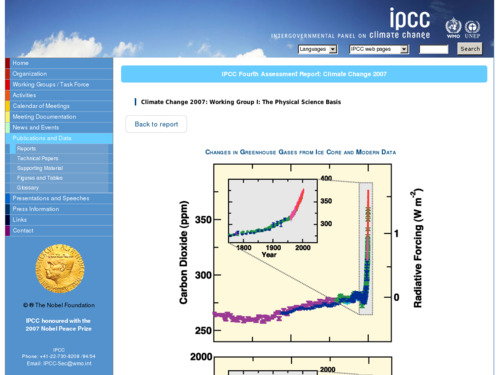 The related website summarizes in graphs the recent monthly CO2, the full CO2 Record, the annual Mean CO2 Growth Rate, and gives links to detailed CO2 data for this location, which is one of the most important CO2 tracking sites in the world. 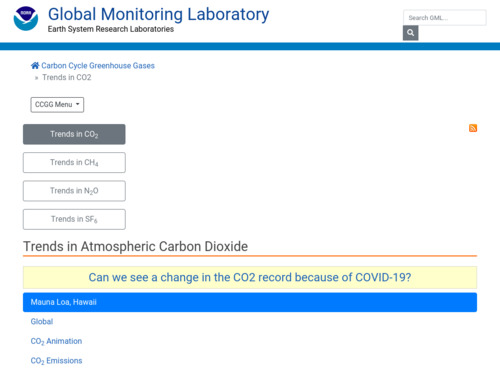 C-Learn is a simplified version of a climate simulator. Its primary purpose is to help users understand the long-term climate effects (CO2 concentrations, global temperature, sea level rise) of various customized actions to reduce fossil fuel CO2 emissions, reduce deforestation, and grow more trees. Students can ask multiple, customized what-if questions and understand why the system reacts as it does. This is a figure from the 2007 IPCC Assessment Report 4 on atmospheric concentrations of carbon dioxide, methane and nitrous oxide over the last 10,000 years (large panels) and since 1750 (inset panels). 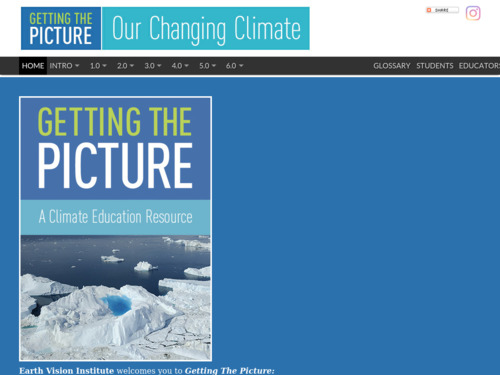 This is a multi-media teaching tool to learn about climate change. The tool is comprised of stills, video clips, graphic representations, and explanatory text about climate science. Acclaimed photographer James Balog and his Extreme Ice team put this teaching tool together. 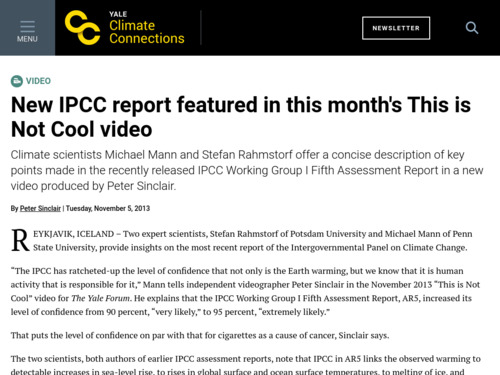 In this video, Michael Mann and Peter Ramsdorf explore some of the information from the 2013 IPCC 5th report in light of public perceptions of climate science.